We think the Boston Acoustics CS 260 II will make an excellent match for those budding audio enthusiasts that have a super-sized taste in sound but an economy-sized budget. 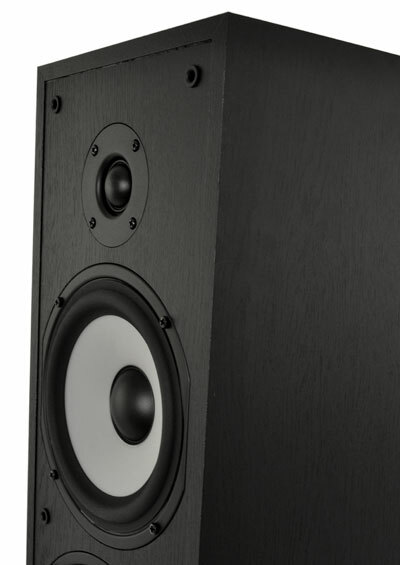 You see, just a few months ago, we reviewed some of the company’s A series loudspeakers, a series which, by BA’s own marketing line, is billed as a speaker with “enduring value.” This led us to believe at the time that we were looking and listening to the speaker line that best represented Boston Acoustics’ interpretation of the value proposition. That very well may be the case, but what we didn’t realize is that if you scroll down…all the way down…to the bottom of any speaker section on Boston’s website you’ll find, almost hidden away, the Classic Series. To some, the term “Classic” evokes the notion of something old, tired, or clung to simply for its nostalgic value. To others it may mean the opposite: an object of enduring timelessness that is to be treasured. Whatever your interpretation of the term may be, we encourage you to set it aside along with any other pre-conceived notions whilst cogitating Boston Acoustic’s budget line of speakers. While they may appear to be a no-frills speaker with a price point so low they couldn’t possibly sound good, we found that the Classic Series’ had some surprises hiding under less-than-flashy exterior. We sat down and spent some quality time with the $199 (apiece) CS 260 II, a two-way floorstander with dual 6.5-inch woofers that appears to be the replacement for the $229 CS 226. In this review, we take a look at some of the changes Boston made for this second-gen edition, discuss our experience with the speakers, and let you know if we think you should go out and give them a listen. We’ll admit it: The moment we picked up one of the boxed up CS 260 II speakers, we started feeling a bit skeptical. The speaker simply seemed far too light for its own good, which is usually a sign of disappointing things to come. Pulling the speakers from their box, which can be a complicated affair on your typical audiophile floor speaker, was a piece of cake. They’re so light, we were able to pop the top of the box and yank ‘em right out. Boston Acoustics doesn’t yet have the specs or measurements for the CS 260 II published yet, but our trusty Health-O-Meter tells us they weigh in shy of 30 lbs. To put that into perspective, each of our reference Aperion Audio 633-T weigh in at 70 pounds. We should note, however, that the CS 260 II aren’t nearly as large as the 633-T, measuring in at 38 ¼ x 7 ¾ x 10 (H x W x D, in inches), a good 3 inches shorter and 8 inches shallower than the Aperions. We gave the cabinets a strong rap with our knuckles and the thin, hollow sound that returned seemed to explain the lightness of the speakers. The cabinetry did not feel very thick, nor did it sound particularly well braced. This is usually an indication that cabinet resonances will get in the way of accurate sound. As we later learned, though, the CS 260 II would surprise us. The CS 260 II have permanently attached feet that mimic the look of the outriggers we’ve seen on some of Boston’s other speaker lines, but don’t require any assembly. Setup was a piece of cake. We set the speakers to face each other, with about 1.5 inches between the front baffles and let them play music at a fairly healthy volume for about 48 hours before testing. The CS 260 II, as best we can tell, will only be available in a black walnut vinyl finish. It isn’t exactly an opulent finish, and certainly a far cry from the A series’ glossy black look, but it’s executed well and pleasant enough to look at. The speaker’s grill runs top to bottom and affixes to the front baffle by way of 8 evenly placed tabs. The grilles frame is a surprisingly flexible plastic that springs back to its original form if bent. With some effort, it could probably be broken, but it’s certainly one of the more resilient grills we’ve seen. As previously mentioned, the speaker uses two 6.5-inch woofers, which are placed in close proximity at the top half of the cabinet. It appears that this generation of speakers will be doing without the phase-plug-style dust cap that was used on the drivers of the previous generation. Not as ornate, but probably functionally similar. The tweeter used is Boston’s 1-inch silk dome, placed less than an inch above the top most woofer and crossed over at 2,800Hz. The back of the speaker sports a fairly large port and a single set of five-way gold binding posts. To test the CS 260 II, we hooked up a Marantz SR6005 receiver, Sony BDP-S1700ES Blu-ray player, Pioneer PL-61 turntable with Ortofon OM-5E cartridge, Bellari phono pre and a Sonic Impact Super-T amp. After our break-in period was over, we set the CS 260 II right next to our Aperion 633-T and connected both to our Marantz receiver for A/B comparison. For audition material, we pulled out our CD copy of Dizzy Gillespie and the United Nations Orchestra’s Live at Royal Festival Hall, Marc Broussards’ Save our Soul, Steely Dan’s Gaucho and Aja (vinyl), and The Red Hot Chili Peppers’ new single from The Adventures of Rain Dance Maggie (MP3). We kicked things off by checking out the third cut on our Dizzy Gillespie disc, “And Then She Stopped.” This track has a little bit of everything that we look for in a good audition piece: punchy kick drum, ample electric bass, poppy percussion, plenty of brass and well-recorded piano, all performed in a classic hall with just the right amount of natural reverb mixed in to make you feel like you are sitting right in front of the band. The recording is challenging, though. A less-than-capable speaker will cringe under the pressure of Arturo Sandoval’s stratospheric trumpet tones and cloud the distinction between bass and percussion. What we heard from the CS 260 II had us in sheer disbelief. The rendering of the live performance was far better than we expected. So much so, in fact, that we double checked our speaker output to make sure we weren’t listening to our reference set of speakers. Nope. As it turns out, the CS 260 II simply defied our expectations…by a lot. Not only did the CS 260 II not crumble under the strain of reproducing extremely loud and scintillating high frequencies, but they sounded very refined with a solid combination of bite and tone. Midrange was full of body and had a very round appeal, giving piano and percussion instruments a good amount of presence with excellent attack and decay. Kick drum was rendered with punch, and a nice amount of snap that comes from that quick moment when the mallet hits the head. After enjoying a few more cuts from our first audition CD, we moved on to the Broussard disc to gauge vocal accuracy and challenge the CS 260 II’s bass response more aggressively. The speakers did not disappoint. While Broussard’s vocal was a little over-exaggerated in the lower mids, the effect was not off-putting. It actually had a “room-filling” quality to it that we think many listeners will appreciate. Bass output again exceeded out expectations, remaining tight, balanced and on par with our front-ported 633-T.
As we continued with our listening, we noticed that the CS 260 II have a very “up front” sound. It’s the sort of approach to sound engineering that can very quickly get a speaker into trouble, but enough restraint has been exercised in their voicing such that the sound manages to leap out at you without going so far as to straight up poke you in the face. We did notice an unnatural bump somewhere in the lower end of the treble region and the slight lower-midrange bloom continued to surface from time to time, depending on the music we listened to, but we expected a certain amount of that considering the fairly light cabinetry and ample bass capability of the 6.5-inch drivers. We found these mild colorations easily forgivable considering the price of the speakers. What these speakers do well, they excel at. During the course of our audition, we were treated to an impressively deep and wide sound stage, zesty but revealing highs, strong separation between instrumentation, and bass response that was balanced and musical. In short, these speakers have no business sounding as good as they do at $200 each. Despite their light and hollow-sounding cabinets, they somehow manage to escape distracting colorations and, while it appears that Boston Acoustics opted to go with less flashy drivers, the level of refinement present in their sound would indicate that the engineers that developed these speakers knew exactly what they were doing when they were constrained with a tight budget. That these speakers were able to compete well sonically with a speaker more than double their price really says something. The CS 260 II may not have the gorgeous, furniture-grade finish of more expensive speakers, and their feather-weight cabinets don’t exactly exude quality, but the CS 260 II deliver where it counts: excellent sound. The CS 260 II don’t exhibit some of the tricky refinements of some more expensive speakers, but If there is a better sounding $200 speaker out there, we haven’t heard it yet. We think the CS 260 II will make an excellent match for those budding audio enthusiasts that have a super-sized taste in sound but an economy-sized budget. We give these speakers high marks for their extreme delivery of “bang for your buck” and encourage anyone interested in a great sounding, low priced, full-range speaker to give them a thorough listen.